Served hot or warm, even cold, it would make an impression on you and your guests. 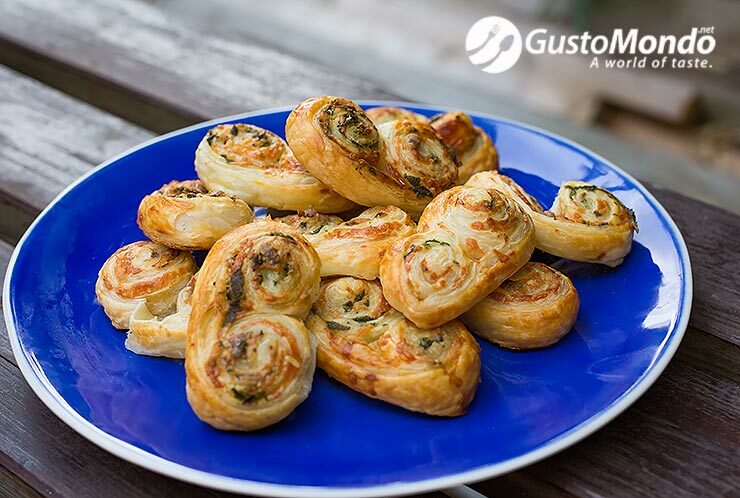 Give this puff pastry palmiers with sage a try, but by any means, should you not like anchovies, substitute them for something else. It’s simple and easy to make and takes no time at all to prepare, although the pastry needs to cool in the fridge for half hour. 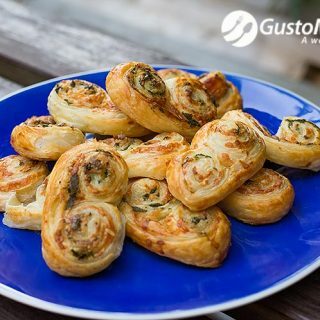 You could try different “fillings”, like sun-dried tomatoes and bacon, or caramelized onion and goats cheese. The possibilities are quite literary endless. As I said before this is easy and simple to make, doesn’t require a lot of ingredients and it’s also fun to prepare. Quickly fry the sage leaves in very hot oil for a few seconds. Remove on kitchen paper to absorb the excess oil and crisp up. Chop up the anchovies. Being so salty, if left into larger pieces they won’t be too pleasant to eat. Small is best for flavour and subtle aroma. Sprinkle the fish and the crushed sage leaves over the puff pastry sheet. Add the parmesan. Roll up the pasty from both sides as you can see in the clip. Let it sit in the fridge for 30 minutes. The pastry will firm up, making it easier to cut into slices. Brush with egg yolk to get a nice shiny glaze. This is a great snack for any time of the day. « Leftover tomatoes? Add some veg and make this spiced tomato sauce.